I’ve sunk dozens of hours into EA’s Need For Speed games over the years. In particular, I played the hell out of the original Need For Speed (1994) and Need For Speed: Most Wanted (2005) on the PC. I’ve driven in slow motion between the wheels of an enormous articulated truck and looked behind me to see four pursuing police vehicles crash into the truck, causing its cargo to spew all over the road and take out a further two pursuers. And I still think the video games have more respect for reality than the Need For Speed movie. 1. 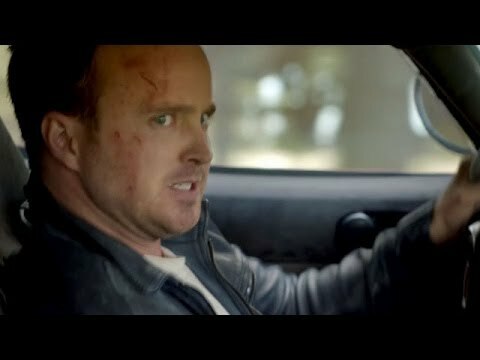 What’s wrong with Aaron Paul’s voice? Paul’s normal voice is fine. Judging by his work on Breaking Bad and Bojack Horseman, he can deliver a range of character and emotion. 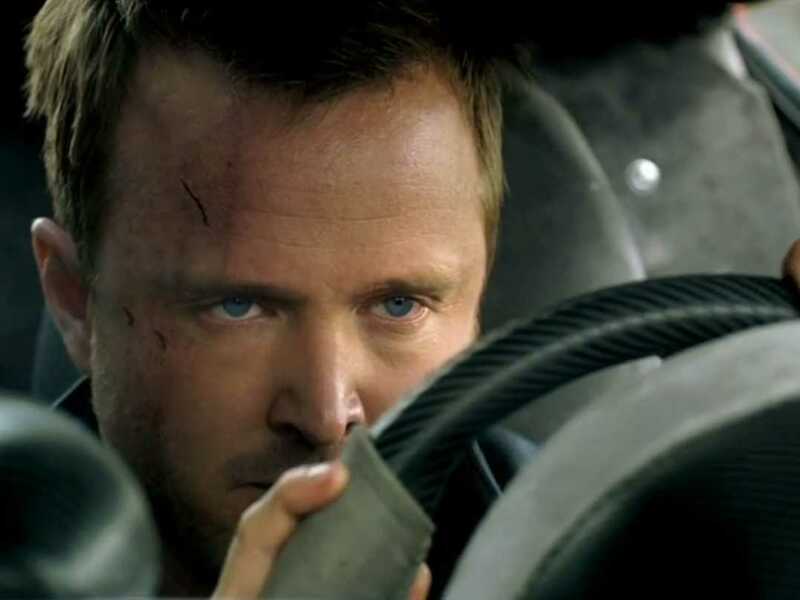 So why does his Need For Speed voice sound like a very bored Batman? The only thing weirder than his voice is his face. 2. 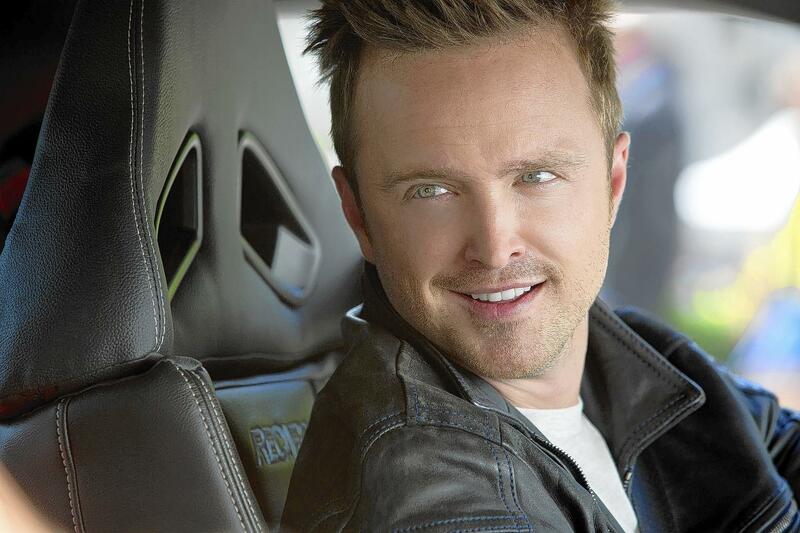 What’s wrong with Aaron Paul’s face? I have no reason to believe that Paul has anything less than a regular human face, which is capable of regular human expressions. But if Need For Speed was my only evidence, I’d have to assume that Paul has only three looks. 3. You expect me to believe that a Ford Mustang could reach 230mph? 4. 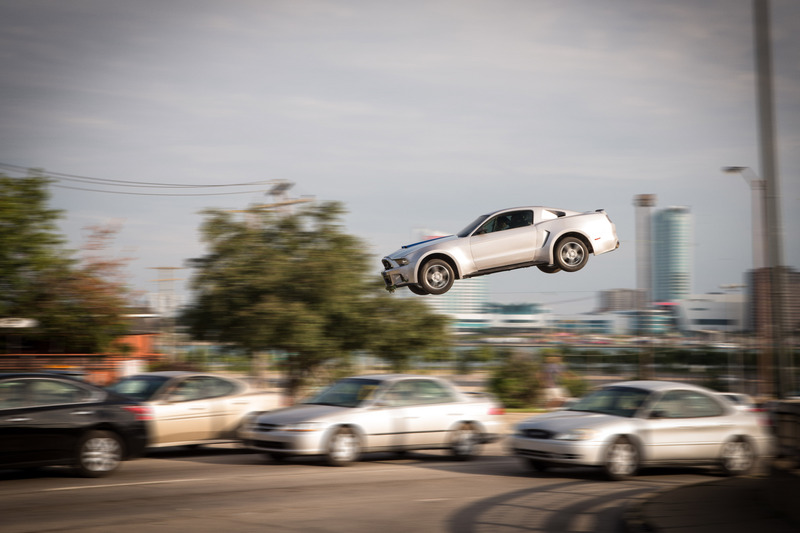 The Mustang regularly defies the laws of physics. Paul drives the Mustang over a central reservation and launches the car about 10 feet into the air, and brings it crashing down on the tarmac on the other side. The camera clearly shows the car landing pretty much face-first. It should be a total wreck, but its magical powers keep it going long enough to be carried into the air by a helicopter with nothing to hold it up but a single chain slung through the driver’s and passenger’s windows and linked to the chopper above. The Mustang is driven at high speed off a cliff into a canyon and lands in the safe, comfortable embrace of that chain. You might think that the roof would be sheared off and the Mustang and its two inhabitants would plunge into the canyon, but this is a magical roof we’re talking about, and is immune to such natural forces. 5. Magic cars make prim English ladies swoon. Paul’s companion in the Mustang is your standard off-the-shelf prim English lady named Julia, who’s at the mercy of Paul’s blue-collar American masculinity. (Don’t worry about remembering that Paul is a blue-collar man: the film will remind you several times.) Now you might think that Julia would be put off (or at the very least killed) by his reckless antics behind the wheel. But the car’s magic does its work and soon Julia is grinning and running away from police and plain old falling in love with Paul. Because her cold British heart was just waiting to be melted by a constipated Batman impersonation. 6. Is everyone in the street-racing scene just a reject from Fast And Furious? Paul’s crew, who help him do car stuff, is just the right ethnic mix of white, black and hispanic, and possesses just the right combination of wise-cracking remarks and urban street smarts, to be instantly identifiable to any audience as a Street Racing Crew. All we were missing was the nerdy Asian guy who could do computer stuff for them. Now I’m a naive and inexperienced person in the world of street-racing, and maybe everyone in that world really is just like this, but I’m choosing to believe that the Mustang’s magic drew these rare and original people together. 7. Apple CarPlay probably stole the role of “Nerdy Asian Guy Who Can Do Computer Stuff” from an actual Asian guy. I’ve never seen a real life car with Apple CarPlay. But in Need For Speed, every car has a CarPlay system embedded in the dash. It’s really useful, because without the built-in GPS these experienced drivers wouldn’t know where they were going. I mean, it’s not like they have a friend flying a plane above them who can direct them where to go. 8. They have a friend flying a plane above them who can direct them where to go. This guy begs, borrows or steals aircraft all the way from New York to San Francisco. He must be in violation of some pretty serious civil aviation codes. Oh, and military too, since at one point he borrows a US Army chopper. It’s weird that no-one arrests him until the end of the film. 9. Paul and his friends seem weirdly OK with getting caught and going to jail. Like, it’s just something that happens to people in their line of work. No biggie. After all, jail isn’t so bad. 10. In Need For Speed jails, the guards bring the inmates iPads so they can watch illegal street races. They also stand there holding the iPad while the inmates watch through the bars of their cell. Like they have nothing better to do. 11. A man who organizes and broadcasts illegal street races under his real identity doesn’t get shut down. Apparently this guy organizes a big race every year. He runs it all from his home studio, where he livestreams his thoughts and race-commentary seemingly 24-hours-a-day. It’s a sophisticated online operation – even though this man apparently doesn’t know how the internet works (he credits “trolls” with helpfully sending him video footage). And it’s totally illegal. But it’s not like he conceals his identity and works under a pseudonym. Oh no, he’s a well-known public figure who uses his real name and livestreams video showing his real face, and law enforcement apparently couldn’t care less. 12. Law enforcement doesn’t seem to care about very much at all. What with allowing an illegal street race organizer to run amok, and allowing a rogue pilot to fly stolen vehicles across America, we already know this is an alternative reality where American law enforcement doesn’t do tough and complicated stuff like their job. So it comes as no surprise that our heroes in the Mustang drive like maniacs and get half way across the country before the police feel like it’s worth their time intervening. But I suppose they were far too busy ignoring evidence in manslaughter cases. 13. Three racers in conspicuous sports cars can race for miles along a freeway and not be captured by a single traffic camera. That’s the only explanation for the police having no evidence of a street race that ended in a young man’s death, and why they must take at face value the testimony of one man with a dastardly smirk and everything to lose. 14. But when they decide to do something, they go all out. In the big race at the end of the film, the police are chasing six drivers in some of the fastest sports cars in the world. They’re having a tough time getting them to stop. They consider using spike strips but decide against it because the cars are going so fast that stopping them that way would be very dangerous. About 30 seconds later, the police decide that “lethal force” is appropriate. They start launching their own vehicles directly at the speeding racers in the hope of taking them out. And in case you think I’m exaggerating how ridiculous this is, they decide to do this next to a passing schoolbus full of children! 15. They thought they could go up against Fast And Furious with this. I can only conclude that the combined powers of a magic Mustang and Aaron Paul’s mystifyingly grating voice have torn a hole in our reality and cut a swathe through space-time to another world where our laws of physics don’t apply and people act like idiots. But the most baffling thing of all occurred in the real world: EA and Dreamworks released a boring, cliched, cut-price clone of the worst bits of the Fast And Furious franchise and expected to succeed. On a $66m budget, the film made about $200m worldwide – a fraction of the ~$1.5bn that Furious 7 made on a $190m budget this year. 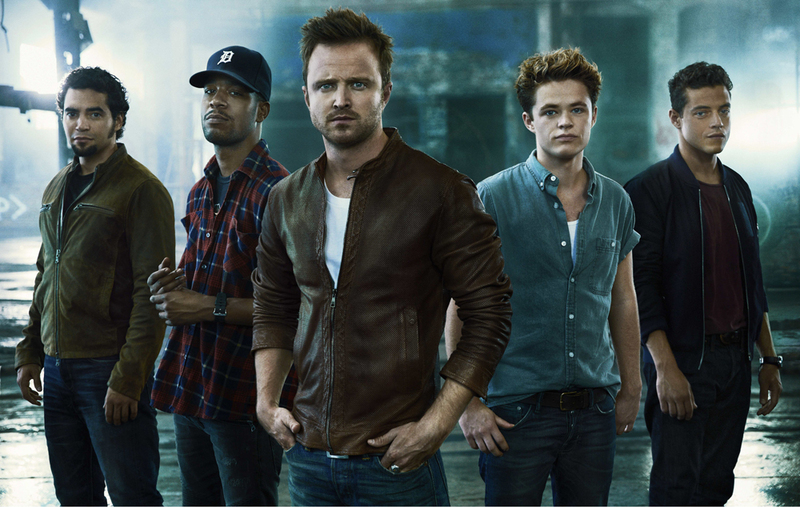 Consider that Need For Speed is the 7th most successful video game franchise of all time, and the most successful racing series. Let’s be realistic: EA should stick to games.